MDH is launching an innovative local based approach to tackle ICE and other drug use in the Mansfield community. We are seeking to recruit interested members of the community to be a part of our steering committee. This committee will provide guidance and advice to our project team and help us make a real difference. 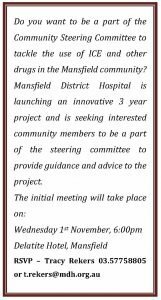 The initial meeting will take place on Wednesday 1st November at 6:00pm at the Delatite Hotel Mansfield. Please RSVP to Tracy Rekers 03 5775 8805 or t.rekers@mdh.org.au.